Bank Asia Limited Job Circular 2017. Bank Asia is one of the best commercial Bank in Bangladesh. Recently published Bank Asia Limited Job Circular. Bank Asia Ltd. (BAL) Career to build a long-term sustainable financial institution through financial inclusion and deliver optimum value to all stakeholders with the highest level of compliance. Bank Asia is a contemporary, upbeat brand of distinctive quality of service and solution that offers a rewarding banking experience as preferred choice of banking partner every time. As part of its journey to build a winning team currently looking for deserving young graduates in Management Trainee. Bank Asia has been launched by a group of successful entrepreneurs with recognized standing in the society. 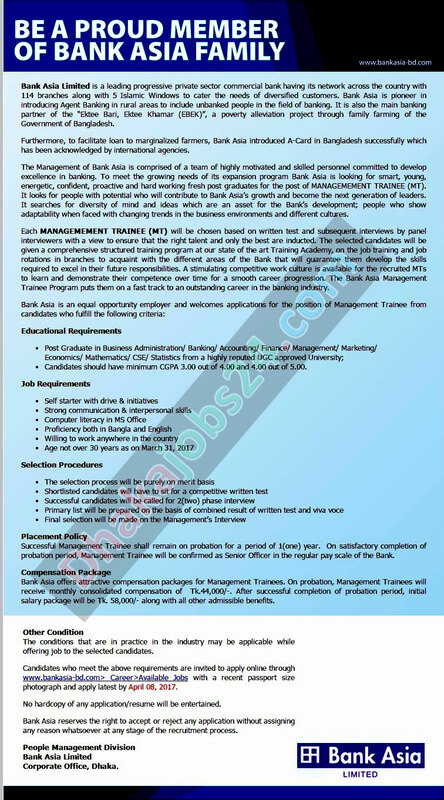 Bank Asia Limited a fast growing commercial bank in Bangladesh is looking for smart, energetic and hardworking people for the position of Management Trainee Bank Asia Limited Job Circular Management Trainee. Job Description: Bank Asia Limited a fast growing commercial bank in Bangladesh is looking for smart, energetic and hardworking people for the position of Business Development Manager. Implementation of Agent Banking & EBEK related services. Preference will be given having reference from Executives of Bank Asia Limited. Education Qualification: Graduate without any 3rd division or class. 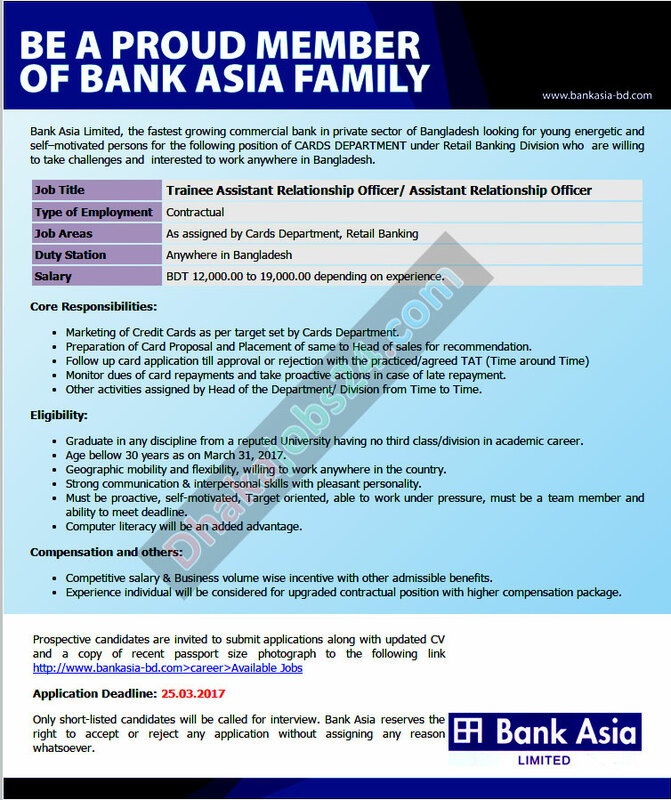 Bank Asia Limited a fast growing commercial bank in Bangladesh is looking for smart, energetic and hardworking people for the position of Management Trainee. Implementation of Agent Banking & EBEK related services.